come to the gate immediately." like my grandma wore, was crumpled to the floor, wailing loudly. "Help,"
told her the flight was going to be late and she did this." picking you up? Let's call him." and let them chat with her? This all took up about two hours. nuts—out of her bag—and was offering them to all the women at the gate. 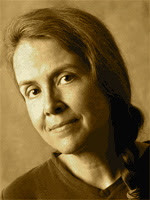 "Gate A-4" [Prose Poem] by Naomi Shihab Nye, from Honey Bee: Poems & Short Prose. © Greenwillow Books, 2008. Photography credit: "Date Filled Cookies or Ma'amoul," by Sanjeeta KK, who provides a recipe on her blog (originally color). Ahhh. this was such a lovely lovely description of something so precious. It just proves that there is no "Us" and "Them"....only "Us".